Build on What You Know You have learned how the Roman Empire was permanently split in A.D. 395. Now read about the fall of the Western Roman Empire. ESSENTIAL QUESTION Why did the Western Roman Empire weaken? When people talk about the fall of the Roman Empire, they mean the Western Roman Empire. The Eastern Roman Empire was much stronger than the Western Roman Empire. 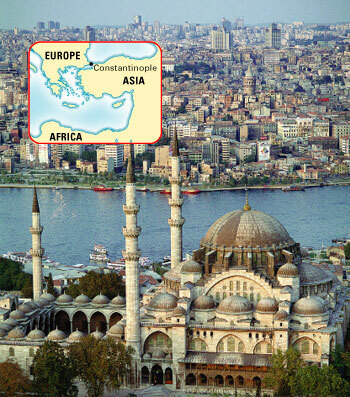 The Eastern Empire's capital, Constantinople, bustled with traders from Asia, Africa, and Europe. As a result, the Eastern Empire had more wealth. Also, the eastern cities were larger and better fortified. And the Black Sea was a natural barrier that discouraged invasions. In contrast, cities in the Western Empire were smaller and less prosperous. They were located farther away from the trade routes that provided both goods and wealth. The cities of the west were more exposed to attack from groups of invaders along the northern border of the Roman Empire. Defense forces were widely scattered. They were often poorly paid, so they had little reason to risk their lives. Istanbul - Today Constantinople is called Istanbul. The Blue Mosque is visible in the foreground of this aerial view of the city. The invaders were often looking for goods to take or people to kidnap and sell as slaves. As attacks on cities increased, the inhabitants chose to leave. They were looking for safer surroundings. The less populated the cities became, the more vulnerable they were to attack. ESSENTIAL QUESTION What groups moved into the Roman Empire? Defense forces on the north and northeast borders of the Roman Empire grew weaker. Nomads —people who move from place to place—took advantage of this weakness and frequently attacked Roman towns and cities. These groups were known as Germanic peoples. The Romans had clashes with Germanic peoples along their northern borders for hundreds of years. A variety of groups made up the Germanic peoples. They all spoke languages that were part of a language family also called Germanic. The Goths mentioned in the opening story were a Germanic people. Romans looked down on these groups but also feared them. To the Romans, the Germanic peoples were barbarians. The term barbarian originally meant someone who spoke a language the Greeks could not understand. Barbarian came to mean someone who was primitive and uncivilized. The Romans referred to the people who lived along the borders of the empire as barbarians. Later, the Romans applied the term to anyone living outside the empire. Although the Romans thought the Germanic peoples were barbaric, they had a very complex culture. They were skilled metalworkers and fond of jewelry. Some groups had elected assemblies. War chiefs headed their military organizations. The Germanic peoples were loyal, especially to their chieftains. 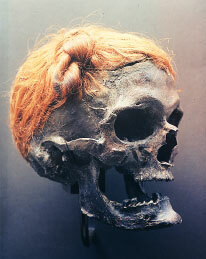 Germanic Skull - This skull still has its hair. The knot in the hair is a characteristic style of Germanic people. Earlier, you read about nomads. Nomads moved to a new location as their food ran out, or when they were driven out of an area by a stronger force. Nomads often fought for the right to remain in a new place. As Rome began to decline, groups of well-armed nomads posed a huge threat to other nomadic people living along the borders of the empire. The people on those borders would be driven into the Roman Empire by a stronger group of nomads. Between 370 and 500 A.D., Central Asian nomads were pushing people out of their lands into both the Roman and the Chinese empires. The most important of these nomadic groups was the Huns. The Huns moved across the grasslands of Asia into Germanic lands. They drove the Germanic peoples west and south into Roman territory. The Germanic peoples were looking for new places to settle and for the protection of the Roman armies. As you learned in the opening story, many Romans did not like the Germanic peoples and took advantage of them. ESSENTIAL QUESTION How did the Western Roman Empire end? 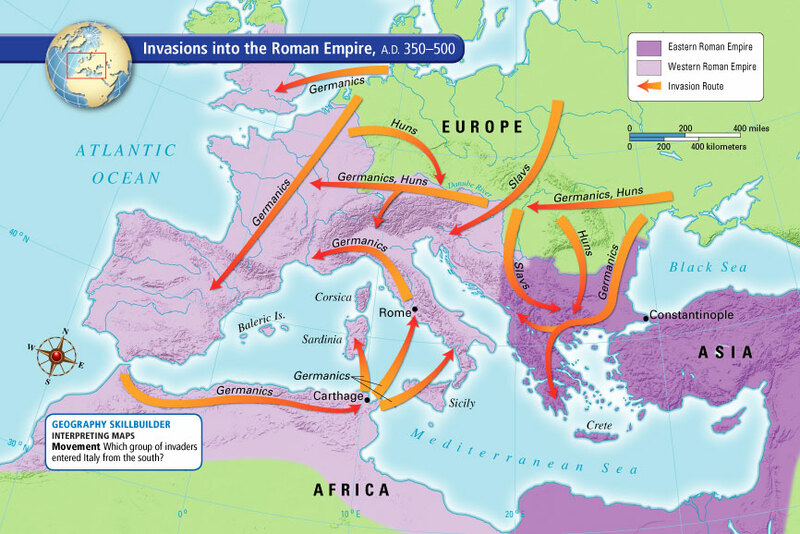 Some people believe the barbarian invasions were the cause of Rome's fall. In reality, Rome gradually declined for many reasons. Corruption of government officials, indifferent citizens, and a breakdown of society contributed to the fall. Historians say a barbarian invasion of the city of Rome marked the beginning of the end for the Western Roman Empire. In 410, the Goths attacked and plundered the city of Rome. Plunder means to loot, or to take things by force. It was the first time in centuries that nomadic invaders had entered Rome. After looting the city for three days, the Goths left. The city of Rome tried to recover and go on, but it was seriously weakened. Germanic peoples also invaded what is now France, Spain, and northern Africa. The empire's army was no longer strong enough to drive them out. Italy was raided almost constantly. In 445, the Huns united under the leadership of Attila. First his armies swept into the Eastern Empire. They attacked 70 cities and then moved into the Western Empire. These attacks placed great pressure on the Roman military. In A.D. 476, the last Roman emperor was removed from power. This date marks the fall of the Western Roman Empire. After Rome's fall, life changed in Western Europe in a number of ways. Roads and other public structures fell into disrepair. Trade and commerce declined. •Germanic kingdoms claimed former Roman lands. The Roman Catholic Church became a unifying and powerful force. The Eastern Empire continued for almost another thousand years. The Western Roman Empire was less wealthy and harder to protect from invaders than the East. Germanic invaders further weakened the empire. In A.D. 476, the Western Roman Empire ceased to exist. 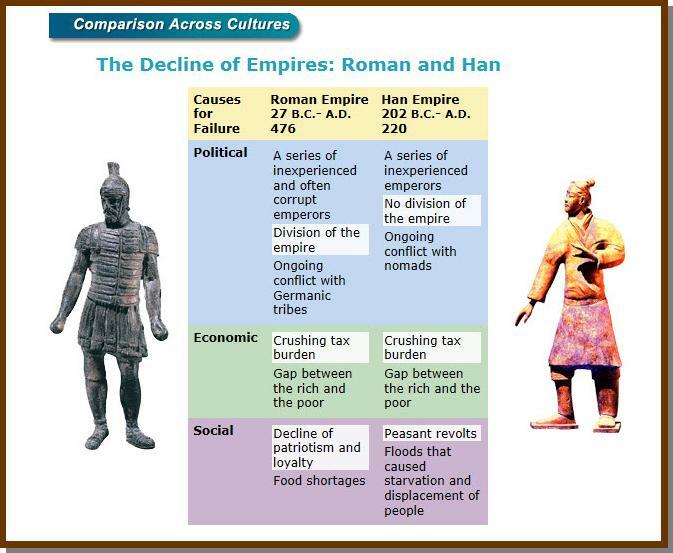 The decline and fall of empires is a repeating pattern of world history. Even large empires eventually break into smaller pieces. Historians wonder about the reasons for the decline and fall of the Roman Empire. Most of them agree that there wasn't just one main reason the Roman Empire began to weaken. There were probably many reasons why the empire fell apart. The selection below discusses one of those possible reasons. Explaining the decline and fall of Rome is a difficult task for historians. Some historians look at the changes in the social and political attitudes of the Romans to find at least one cause for the weakening of the empire. For example, they believe that the nobles and people in the cities cared more about pleasing themselves than about the well-being of other people. * Historians also know people failed to participate in the government. * Some public officials were not as qualified to perform their jobs as others in the past had been. Engraving - A Gothic leader forces the Roman emperor to surrender. The backbone of the Roman Empire was its army. * However, in the later years of the empire fewer men were willing to serve in the military. * This made it necessary to hire foreigners to serve in the Roman army. * Rome. This lack of dedication weakened the army that was supposed to protect the empire.